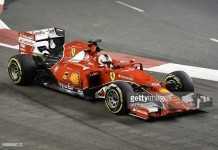 Sebastian Vettel recovered from a heart-stopping track invasion by an unidentified fan on Sunday as he convincingly won the Singapore Grand Prix and closed the gap on Mercedes. Ferrari’s Vettel led wire-to-wire for his third win this year, ahead of Red Bull’s Daniel Ricciardo, with championship leader Lewis Hamilton of Mercedes forced out with mechanical problems. 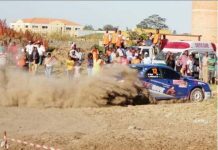 But Germany’s Vettel had a major shock on lap 36 when he spotted a man walking on the track, a bizarre incident which brought the race to a temporary halt. “There’s a man on the track!” he yelled over the team radio, as the safety car came out for the second time in the floodlit night race. The disruption was the closest Vettel came to an upset and there were echoes of his quadruple world title romp with Red Bull as he calmly won by 1.4 seconds. “Yes, you did it!” Vettel screamed to his team-mates over the radio as he crossed the line, with fireworks exploding over the grandstand and lighting up the night sky. 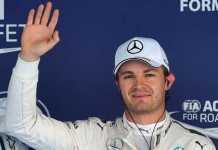 With his 42nd career victory, Vettel draws within eight points of second-placed Nico Rosberg of Mercedes on the drivers’ standings, with Hamilton’s lead reduced to 41. Hamilton’s retirement just after halfway completed a miserable weekend for the Briton, who was in line to match Ayrton Senna’s tally of 41 wins in 161 races but left empty-handed. Vettel got away smoothly from pole with the top cars staying in formation behind him, but 17-year-old Max Verstappen had a horror start when he stalled and then rejoined one lap behind. Overtaking was non-existent in the early stages on the narrow street track but second-placed Ricciardo was slowly hauling in the leader when a crash brought out the safety car. Felipe Massa exited the pitlane and went straight into the side of Nico Hulkenberg, sending his Force India briefly airborne and into the barriers, and then out of the race. The top three bunched tightly after the restart followed by Hamilton, until the championship leader suddenly lost accelerating power and eventually retired on lap 32. 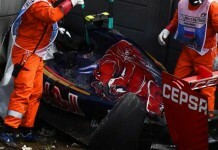 “It hasn’t been our weekend as a team, but sometimes it happens,” a dejected Hamilton said as he left the team garage. At the front, Vettel dropped the hammer and set a fastest lap of 1min 50.520sec as he extended his lead to four seconds at the halfway stage. But the German got a shock when he spotted a fan walking along the circuit on a few laps later, bringing the safety car out yet again. Jenson Button went into the back of Pastor Maldonado’s Lotus after the restart, showering shards of shattered bodywork over cars behind and ultimately forcing the McLaren driver out. Young Verstappen fought brilliantly up to eighth from the back of the grid and angrily refused when Toro Rosso ordered him to yield his spot to team-mate Carlos Sainz. Out in front, Vettel was untroubled and he duly completed the win to send out a message to Mercedes that they will have to work to secure their second straight one-two in the title race.